The Spot Removal tool (earlier versions of LR, before LR 5, do not have the same ability to remove spots as LR 6 does) is found in the Develop module in the toolstrip at the top of the Basic panel and is designed to remove dust spots as well as larger spots or items that you don’t want in the photo, maybe a person or a small bench or a branch that does not look right: I often delete small rocks or sticks in the foreground of a photo. This tool needs some getting used to, so pick a photo and practice on it. You can use the tool in two ways. 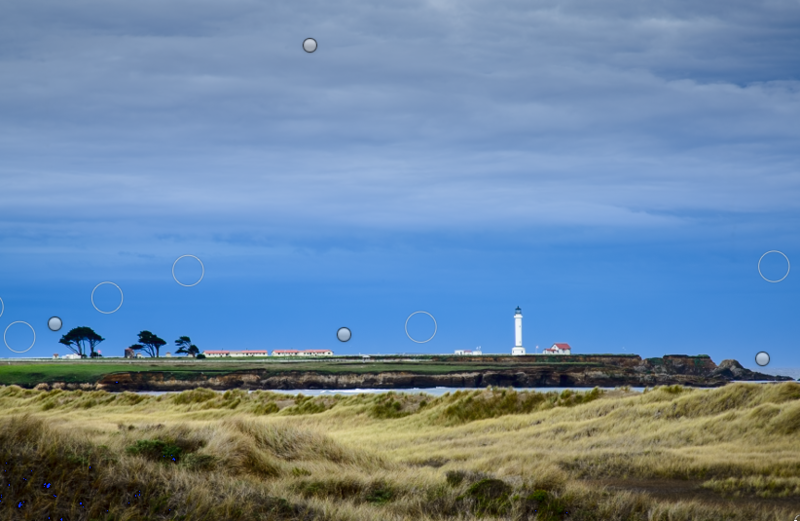 One is to look for spots or objects on your photo and simply click and delete as needed either with the actual circle spot tool or by click-hold-drag with the spot tool for non-circular areas. The second way is to click the Visualize Spots box to invert the photograph, this is especially useful for a sky, and then click and delete the round white spots that will show up in the photo if any spots are on it. You can also click-hold-drag for larger non-circular areas. You can choose Heal or Clone, although I have not yet been able to tell a great degree of difference in the approach and most often use Heal. Heal is intended to match the correction (using a sampled area that includes texture, lighting and shading) to the selected area (the area you want to correct). Clone duplicates a sampled area to the original area. I would say try Heal first and if that does not work, then try Clone. The pins show the correction spot: the marquee signifies the correction. The size of the brush you use will vary based on what you want removed or corrected. Using the brush size lever you can go from 0 to 100 for the brush size. The square left bracket and right bracket keys also control the size of the brush and thus the marquee. You can use the scroll on a mouse to control the size of the brush. When you click on the photo on the spot you want to correct or remove, a white marquee appears on that spot (a thin line) and on the spot where the correction was taken from (a slightly thicker line). So, the double marquee marks the selected area and the area where the correction is coming from. You can change the sampled area by: (1) Using the handle of the sampled area to drag and select a new area to use, and (2) Clicking the handle of a sampled area and pressing the forward slash (/) key. The tool will then auto sample other areas. If a hand appears in the circle you can drag the circle, either circle, to a new spot. If two arrows with a bar in the center appears, this happens when you click on the circle line itself, you can enlarge the circle or make it smaller. Single click creates a circular spot and automatically finds a source. Good for spots from dirty sensors or specs in the photo. No black pin appears. Ctrl/Cmd + click creates a circular spot, drag to set the source of the spot. No black pin appears. Ctrl/Cmd + Opt/Alt + click to create a circular spot and drag to set the size of the spot. This is good to use if you know exactly what area you want the correction to come from. No black pin appears. If either correction does not cover correctly, click on it and move it to where you want it to go, lining up any edges as needed. If the correction does not work out, try it again with a slightly bigger circle. If you do not cover enough of the spot some of the item will show through. Select a pin or marquee, and press Delete to remove the adjustment. Press Option/Alt and click within a spot to delete it (a cute little pair of scissors appears). Press Option/Alt and drag the mouse to draw a marquee (the scissors appear) and let go of the Opt/Alt key and the spots that are within the marquee (this works great if you’ve made multiple spot removals and are not happy with them) are automatically deleted. To remove all adjustments, click on the Reset button below the toolstrip. Remember this does remove all of the adjustments you’ve already made. To use this tool by dragging it, you set a circle size than drag it over the area you want to correct or delete (this option creates a black pin within both marquees that you can use to move the marquees). This may not work the first time, leaving a brownish or other colored edge around the correction. Simply repeat the procedure area again, as many times as you need to, in order to cover the area. You need to start from an area outside of any marquee in order to do this. Sometimes I literally scrabble over the item, using a very small brush, several times: this seems to work effectively most of the time. You may need to click on the marque and move it to match up edges or lines, depending on your photo. In the photos on the left, you can just see a bench sticking up in the top photo. The first correction was made in the middle photo, the dark portion of the bench still appears. In the bottom photo the bench is gone, having been corrected multiple times, and the photo is finished. If the editing process does not work in LR, then you will need to use Photoshop or some other program with more control in this area of image editing. Using the tool this way, a black pin appears to show you the area you corrected and the area you chose the correction from and you can move the area that you chose for a correction to suit your needs. If you click open the Spot Removal tool you will see a gray strip at the bottom of your photo that says, Tool Overlay: Auto and then a box with the text “Visualize Spots” next to it. Click on the box. Once you do this the photo turns into an inverted black and white photo. (You can leave this on and run through all the photos in the film strip if you want to.) You can use the slider at the bottom to vary the contrast threshold of the inverted image, which may allow you to see spots that you missed at another setting. You can spot check one photo and then remove all the same spots in one or more other photos providing the other photos are exactly the same so that the spots are in the same place on each photo. You do this by making the spot correction on one photo: with that photo still selected click on all of the photos you want to correct—you can use Command/Ctrl and click on each one, then click on Sync...(just to the right and bottom of the photo at the bottom of the panels). When you click on Sync a box comes up with some options. In this case we are only interested in the spot removal tool, so click on Check None to unmark all boxes then click on Spot Removal (top right), then click on Synchronize. If you see Auto Sync, not Sync, click on the tiny little button to the left of the text (it moves up and down) and Sync will show up. Be sure to check your photo after spotting it, as sometimes the correction does not work in your favor, especially the auto correction. I’ve made a correction in the sky, failed to check the photo on the screen, and printed, only to find that the correction pulled from the wrong area of the sky in two spots—a real waste of ink and paper! The spot removal tool makes a double circle when you have feathering on. When feathering is off, the circle is a single circle. The degree of feathering assigned creates a smaller or larger double circle. To feather or not feather depends upon your subject. If you can leave a hard line and it works in that photo then you can use 0 feathering or less feathering, but photos oftentimes need more feathering in order for the correction to fit in. Feathering affects the edges of the correction, spreading the edges out so that they blend into the photo, it does not control how much correction is applied to the original spot. Opacity affects how much correction is applied and goes from 0 to 100. In the photo to the right, the first photo has 0 feathering and 100 opacity, causing a harder line to be seen. The photo on the right has feathering set to 100 and opacity to 100: I made no other corrections to the photo in order to show the basic difference. The photo on the right could be corrected more by moving the correction spot into line with the boards and making some small light and dark corrections with the paintbrush tool to blend it in. It would not blend in with 0 feathering no matter what other corrections were made because 0 feathering leaves a hard edge.